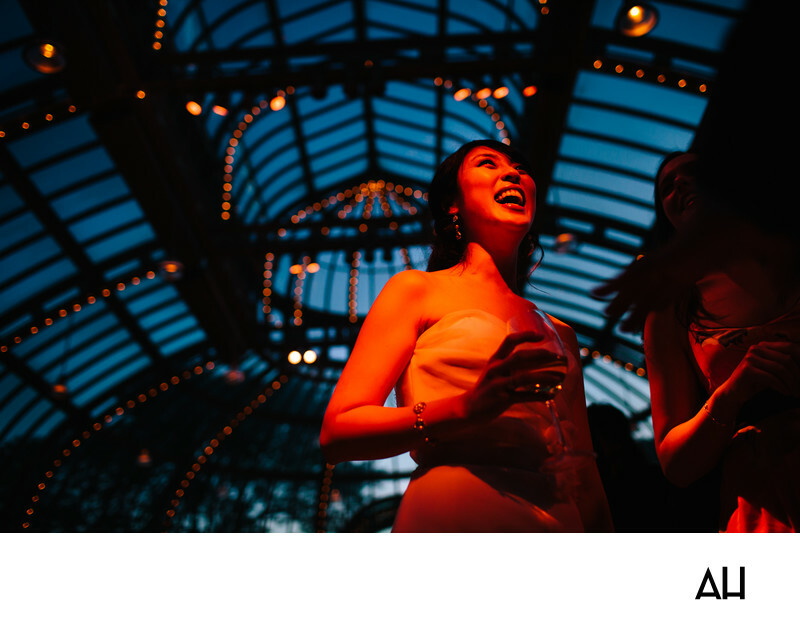 A Brooklyn Botanic Garden wedding photographer is able to take pictures of a breath-taking venue set in a bustling city. Here, wedding attendees can leave the stresses of the city behind and enjoy the sights, smells, and sounds of the Garden's many features. From the Lily Pool Terrace, to the Atrium and the glass-walled Palm House, a Brooklyn Botanic Garden wedding photographer could not ask for better scenery. The Atrium is often used for ceremonies and the Palm House for receptions. The Palm House is a magical space that will be remembered vividly by couples and their guests for years to come. This photograph was taken in the exceptional loveliness of the Palm House. The Palm House in completely enclosed in glass, giving guests a view of the gardens outside regardless of where they sit or stand. The Palm House seats up to 275 people, though, as typical with any wedding, guests are rarely sitting for long. The venue is exceedingly beautiful to behold in the daylight and as the sun sets and the sky above grows dark, guests are really in for a treat. This picture shows the splendor of the Palm House at night, with the sky a bluish black color in the twilight of the evening. That glass ceiling through which guests see that enchanting sky is a highlight of this Botanic Garden wedding photo. The window panes that makes up the entire structure of the Palm House are outlined by black frames and little golden lights. The small lights combined with the natural light of the stars and moon that shine down into the Palm, caste a glow about the room that is other-worldly. Awash in that glow is the bride. She stands beneath the unique ceiling and wide open night sky, holding a glass of wine, laughing with friends. The joy on her face is so apparent that it is as though the warm light that illuminates her is coming from within, from the depths of her very soul. This day held memories that will be everlasting for her and her husband, memories that the couple will revisit over and over again.